Fill up your cavernous living room or entrance with a statement-making 240 x 335cm rug from Brosa. A rug of this size can help you pull together your space or create a showstopping piece that will get all your guests talking. We have a range of rugs to suit your space, from minimalist styles to eclectic options. Pick from a huge variety of colours, styles, patterns, and fabrics to design a space to be proud of. 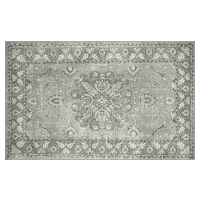 Choose a rug with a bold pattern to create a decorative, standalone piece, or select a more subdued rug - such as a white rug - if you’re just looking to cover the ground. Our neutral-coloured rugs are especially important if you use other bold centrepieces, such as your sofas or other decor, in your room. Just because you’ve invested in a larger rug shouldn’t mean you have to sacrifice quality. Our range of 240 x 335cm rugs are designed and produced in regions renowned globally for their rug-making craftsmanship. Browse our collection of rugs and buy online to see just how superior the make of our rugs are today! If you’re not convinced - or the colour just isn’t right for the room - we offer 7 day returns.